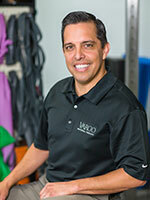 is a Vargo PT Partner and the Clinical Director at the Canyon Country Vargo PT clinic. Mr. del Rio has been a licensed physical therapist at Vargo PT since 2000 and brings a wide variety of clinical experience. His specialties include Sports/Orthopedic Rehabilitation, McConnell taping, Kinesio taping, injury prevention and advanced manual therapy techniques. He is also an ASTYM certified clinician. Mr. del Rio holds a bachelor’s degree in health science and a master’s degree in physical therapy from California State University, Northridge. Mr. del Rio works closely with local high school and college athletes. He currently serves as the team sports physical therapist for Canyon High School Football. As a sports physical therapist, he also serves as a consultant to The Master’s College Athletics Program. Mr. del Rio is a member of the American Physical Therapists Association (APTA) as well as the Santa Clarita Chamber of Commerce. Married with a daughter, Mr. del Rio enjoys golf and playing soccer in his free time.